We live in a time of reduced economic advantages its been noted… We seemed to be mad for Kobe just a short while ago. Perhaps washing it down with very limited growth bottle of Bordeaux (which actually is probably a bad combo) but how do you show the fellow swells at the Cigar Dinner you are who you are if not through conspicuous consumption? Hmmph. Times change and our menus and meals go the way of the hemlines. The most desired restaurants of the day are now epitomized by New York’s David Chang’s growing ‘Momofuku’ and her descendants. The ingredients of choice are more centered around Pork Bellies and the once spurned Chicken. 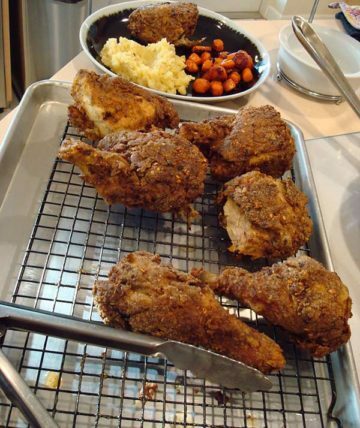 Fried Chicken is HOT and many of us in our kitchens are more interested in that crunchy wonderment than we are with pheasant or squab. At a dollar a something a pound might be driving that to return to the dollar and sense. We have been testing out a variety of fried chicken methods for “Norman’s 180”. I can’t seem to tire of them. Don’t worry, my cardiologist thinks I still eat Kobe. I gave him up and took up biking. Between bites. And if we are not frying it we are working on other punchy recipes. It wasn’t so long ago I was sitting on the verandah of a hotel restaurant overlooking Waikiki beach, I awaited a lunch menu. I’d spent hours walking in Chinatown looking for the odd and beautiful little dishes I love to use in our dégusatation menus here at the restaurant. I had very little luck and a keen hunger was rising up in me. An Asian gentleman seated near me was served a platter of chicken curry. His waiter lifted strips of shredded chicken from a porcelain serving bowl and draped them over the pristine mound of white rice. The curry orange colored rich cream was spooned over this. The intoxicating steamy aromas wafted over in my direction. It was as inviting as a beautiful woman’s perfume. I quickly ordered the same dish and when mine arrived I was further pleased to see that the chef had included bell peppers, fennel, celery and carrots in the cream as well as an interesting spicy chutney, a mound of tiny dried currants and a mound of sweet toasted fresh local coconut. All of this was mixed together by me as I ate. I wondered. Why had I not eaten chicken curry in so long? We all associate curry with India. It is interesting to note that the first domesticated chicken appeared in India around 2,000 BC. It was bred from the wild red jungle fowl. “In Hawaii, European travelers found a domesticated fowl call the “moa”, a descendant of a wild jungle fowl probably brought in from Malaysia. In 1826, however, the ship Wellington docked in Hawaii, taking on fresh water and dumping its old water (remaining from its voyage from Mexico), which contained mosquito larvae carrying a bird pox that immediately infected the Hawaiian chickens and devastated the birds of the islands”. Americans eat about 33 pounds of chicken a year. None of us will be eating the moa jungle fowl…curried or otherwise. But many of us will be eating fried…that is if we are not eating spiced up grilled wings, Korean style. Back to you Mr. Chang.